The winter-chill beating comfort food goodness of a classic Shepherd’s Pie, minus the meat. 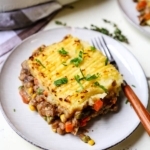 This Vegan Shepherd’s Pie Recipe features a savory vegetable, lentil and gravy loaded interior, topped with pillowy mashed potatoes, baked in the oven to perfection. The incredulous look in his eyes when he said that last part let me know this lentil shepherd’s pie had indeed been a success. And what a relief! You see, we both LOVE classic shepherd’s pie. I mean, what’s not to love about a savory vegetable, meat and gravy loaded interior, topped with pillowy mashed potatoes, baked in the oven until taste-bud nirvana occurs!? It’s comfort food that can provide a warm hug when the winter chill creeps into your bones. Well, the snow and ice of February is a way off at this point – but, as Jon Snow likes to remind us, winter is coming. As Ben and I have generally embraced more of a plant based diet, there are a few recipes I haven’t wanted to augment – fearing that trying a vegan version might make us miss the original. Well, I’m here to tell you friends… This vegan shepherd’s pie recipe is almost indistinguishable from the original. In fact, I’d venture that this is one of the best lentil recipes I’ve tried to date! 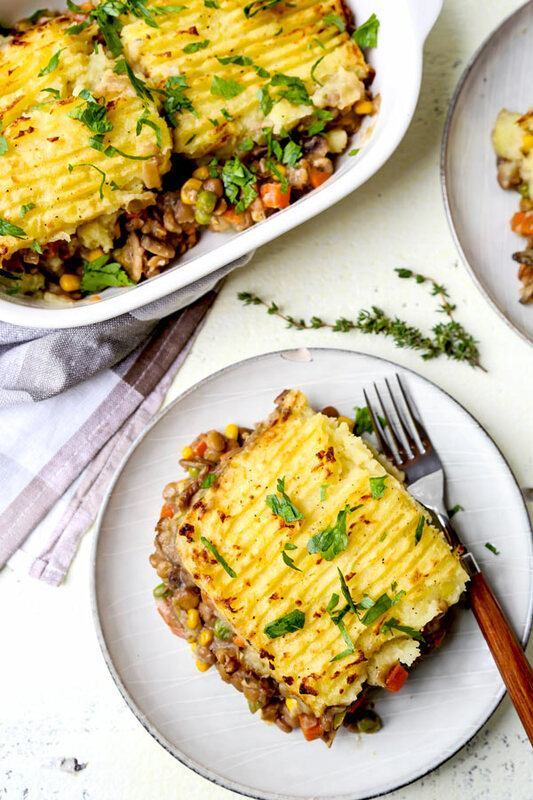 Who would have thought a plant based shepherd’s pie could pack a savory punch – and approximate the texture of meat without having to resort to a meat substitute? This is vegan comfort food for the winter (and holiday season) to come. Shepherd’s pie has quite a few variations. But at its core, a classic shepherd’s pie is a savory casserole with a bottom layer of meat and vegetables stewed in a gravy or thick sauce – and a top layer of mashed potatoes. Once assembled, the whole casserole is baked in the oven until the potatoes are golden brown. And, while you may have always called this shepherd’s pie, you may have also heard the term cottage pie. 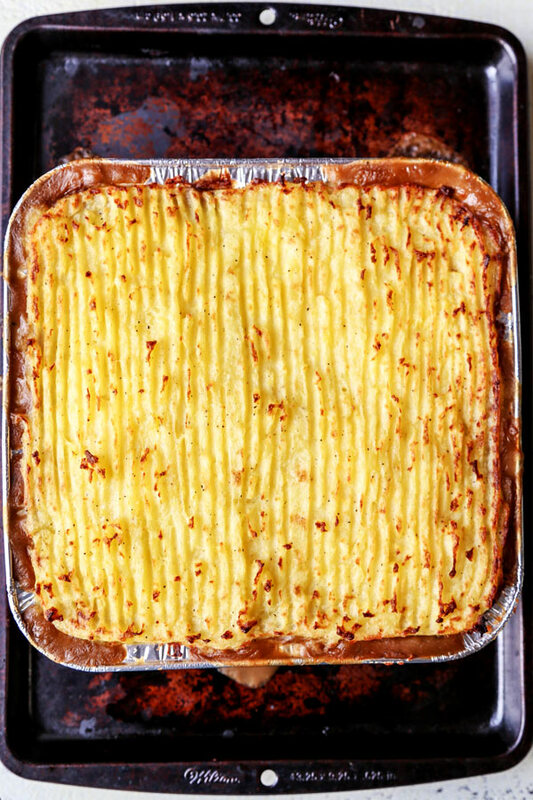 So, what’s the difference between Shepherd’s Pie and Cottage Pie? Now, you’ll frequently see both terms used interchangeably – but there is a method to the naming madness. You see, the title used is usually in reference to the type of ground meat in the recipe. Typically, shepherd’s pie refers to a lamb mince pie. And a cottage pie would usually include ground beef. However, since we’re using a combination of lentils and mushrooms for this vegan shepherd’s pie, all naming conventions are out the window! I’ll still go with shepherd’s pie though, thank you very much. 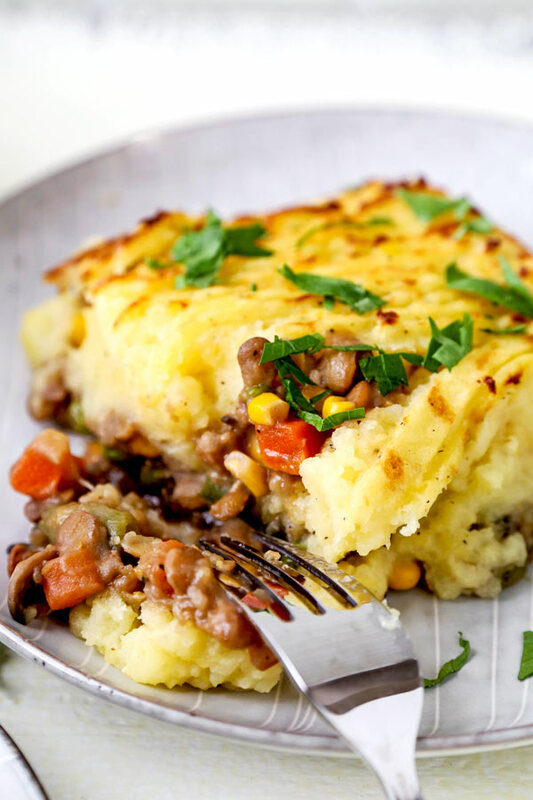 This hearty and healthy shepherd’s pie is a super easy vegetarian recipe that calls on lentils and mushrooms to act as the ‘meaty’ element. On the surface of things, that might sound a little suspect. How are a legume and a mushroom going to approximate meat? Well, In regards to flavor, mushrooms have much of the same earthy, umami flavor you get from simmered ground beef. 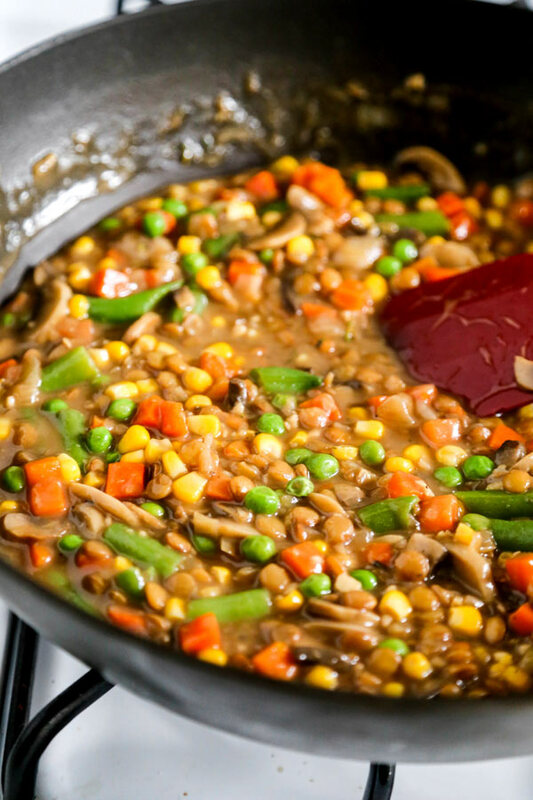 And, from a texture perspective, cooked lentils produce a consistency that – when combined in this casserole with the other veggies, gravy and mashed potatoes – really stands in for the mouthfeel you’d get from ground meat. It might sound crazy – but it’s true! Most of what you’ll need to make this vegetarian shepherd’s pie is probably already sitting in your pantry – or it’s a quick trip away at the corner shop. It’s so cool that it has never been easier to make meatless versions of comfort food classics! There are two main elements to preparing this easy shepherd’s pie: the potatoes and the filling. Peel and cut about two-and-a-half pounds of Yukon Gold potatoes into manageable chunks. Then place them in a large pot of water and bring them to a boil. Boil the potatoes for 10-12 minutes or so, until they’re tender. Drain your potatoes and place them in a mixing bowl. Then, just mash them up! Use a fork or potato masher and really go to town until they are smooth. Add about three tablespoons of vegan butter, two tablespoons of extra virgin olive oil and a little salt & pepper. Mix again. Your potatoes will be velvety smooth – and packed with flavor. Place a kitchen towel over the mixing bowl, and let’s move on to our filling! 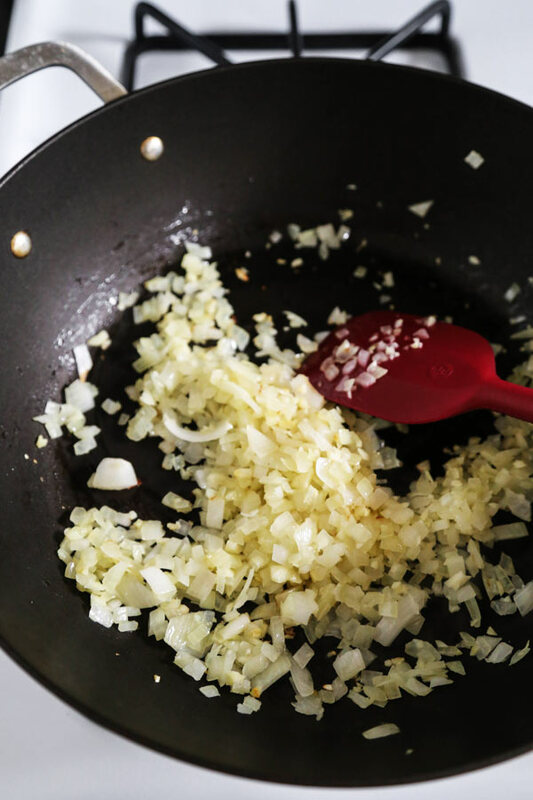 Get a large pan going over medium-high heat and add a tablespoon of olive oil, plus a medium diced onion and a couple cloves of chopped garlic. Your onions should be translucent in 2-3 minutes. 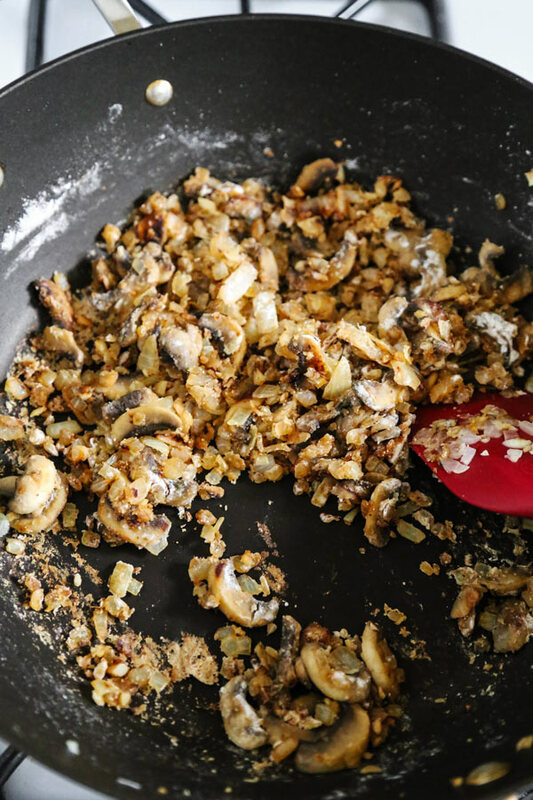 Add a cup and a half of sliced mushrooms and cook for a couple of minutes – until the water the mushrooms release at the start of cooking has evaporated. Then add three tablespoons of flour, stirring the entire time. About 1 minute total. At this point I like to add three cups of mushroom stock, ½ cup of rinsed dry-lentils and about a teaspoon of thyme. The stock will interact with the flour and thicken into a gravy. Hit it all with a little salt and pepper and bring to a boil. Once boiling, lower the heat, cover and simmer for about 20 minutes. After simmering, add a full 10-ounce bag of mixed frozen veggies. Peas, carrots, corn and green beans work super well in this vegan shepherd’s pie! Cook for another 10 minutes. Simply bake for 20 minutes at 425°F. For the last five minutes, crank the heat up to broil so your potatoes get nice browned ridges. How does this vegan shepherd’s pie taste? I gotta tell you… The resulting taste is just out of this world! There’s a savory flavor of mushrooms and a meaty nuttiness from the lentils that just play so nicely off the little pops of freshness from the frozen peas and corn kernels. 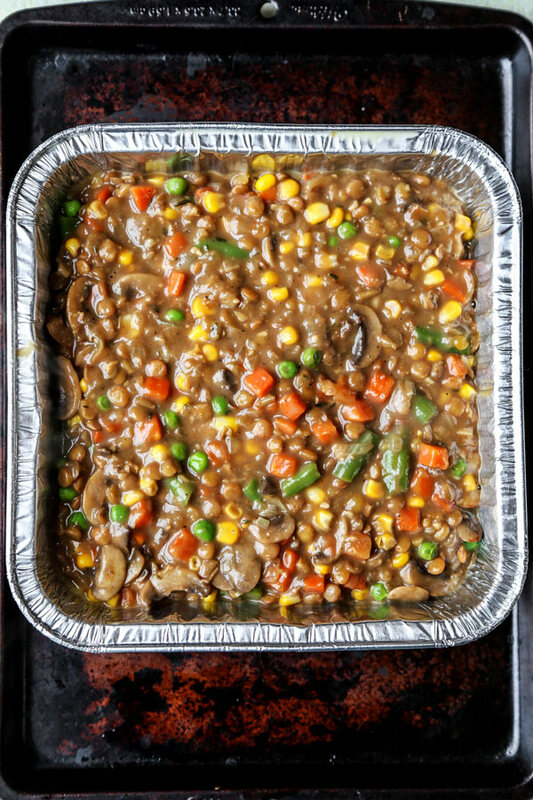 It’s enveloped in a luxurious and thick mushroom gravy. The potatoes are equal parts velvety smooth – and perfectly browned and slightly crispy on top. Comfort food: level 10! Let’s hear it for the mighty lentil! Lentils have folate, fiber and iron to spare. But did you know lentils also pack in the protein? Yep, these vitamin B and zinc loaded legumes are a superfood superstar. And, since they’re also a wonderful source of soluble fiber, eating lentils can actually help lower cholesterol if you follow an otherwise healthy diet. So should we call this vegan pie a shepherdless pie? Well, no matter what you call it, there’s no denying that it’s a meat-free-force to be reckoned with! 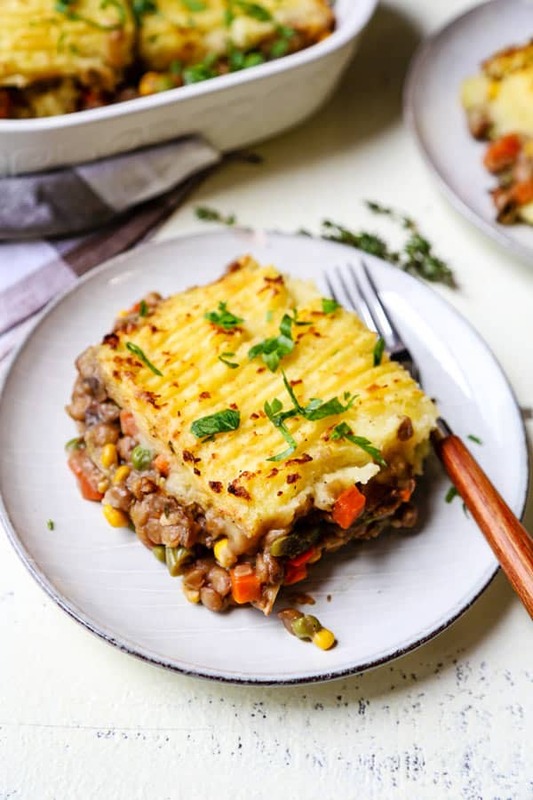 This vegan shepherd’s pie is one of my favorite new vegan main dishes. With flavor to spare, it ticks all of those boxes I hope a vegan version of a comfort food classic will. And you KNOW we’ll be eating vegan shepherd’s pie at our place all winter long. The warming, comforting deliciousness counteracts the chill of the howling wind! What about you… What’s a dish you count on to keep you warm in the winter months? I’d love to hear about it in the comments! Did you like this Vegan Shepherd’s Pie Recipe? Are there changes you made that you would like to share? Share your tips and recommendations in the comments section below! 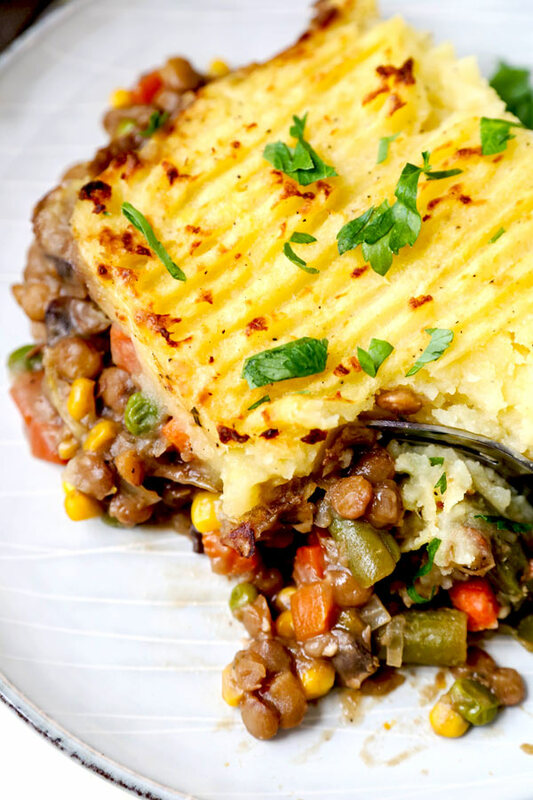 A healthy and meatless shepherd’s pie recipe packed with flavor. Grease an 8×8-inch baking dish – or other comparable sized baking dish. Peel and cut the potatoes and transfer them to a large pot filled with water. 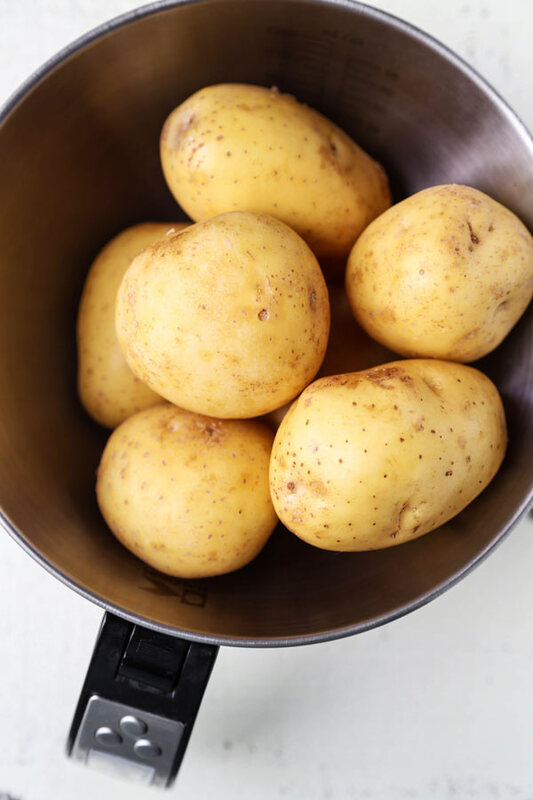 Bring the water to a boil – and boil the potatoes for 10-12 minutes, or until tender. Drain and transfer to a mixing bowl. 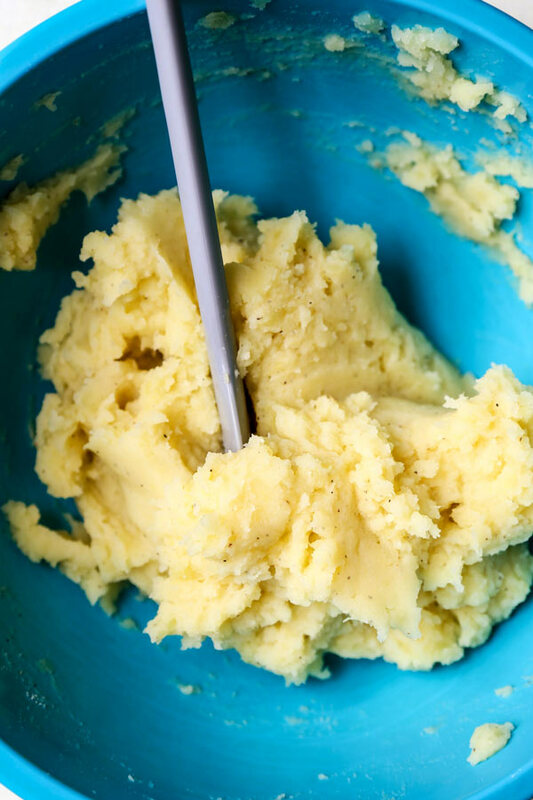 Using a potato masher or a fork, mash the cooked potatoes until they are smooth and add vegan butter and extra virgin olive oil. Mix well – and season to taste with a little salt and pepper. Cover with a kitchen towel and set aside. Meanwhile, in a large pan over medium-high heat, add 1 tablespoon olive oil, onions and garlic. Saute for 2-3 minutes, until onions are translucent. Add mushrooms and saute for 3-5 minutes, until the water released by the mushrooms has evaporated. Add flour and cook for 1 minute, stirring constantly. Slowly add mushroom stock while stirring. Then add lentils and thyme. Season with salt and pepper and stir. Bring to a boil. Then lower heat to a simmer, cover and cook for 20 minutes. Add frozen veggies, cover and cook for an additional 10 minutes. Place the baking dish on a baking sheet (this is to catch any overflow of gravy once it goes in the oven). Pour the lentil mixture into the baking dish and carefully top with mashed potatoes, one large spoonful at a time. Spread the mashed potatoes using a fork or spatula – and smooth it until you get an even layer. 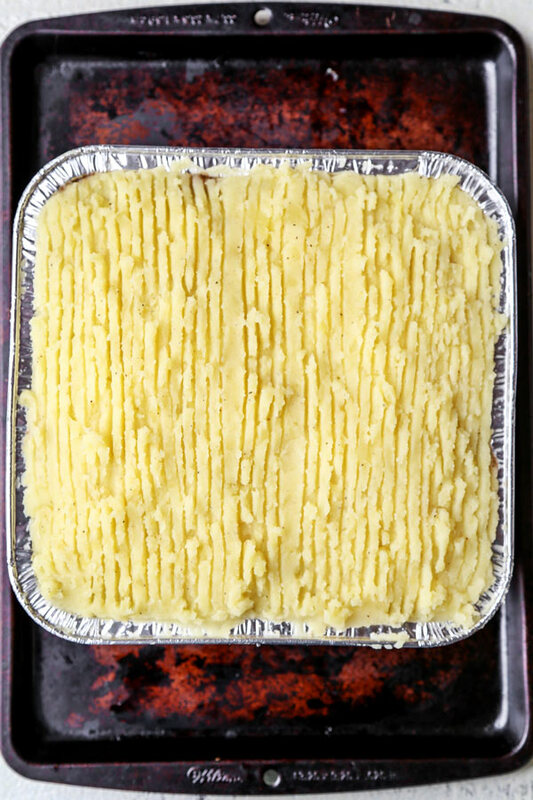 This step is optional: run the tines of a fork over the mashed potatoes to create elevated lines (my mother used to do this – and I think it makes the finished pie look prettier). Bake in the oven for 15 minutes (with the baking dish underneath). Then turn oven to broil and broil for 5 minutes to get a crispy, golden brown top (optional). Top with chopped flat leaf parsley and serve.